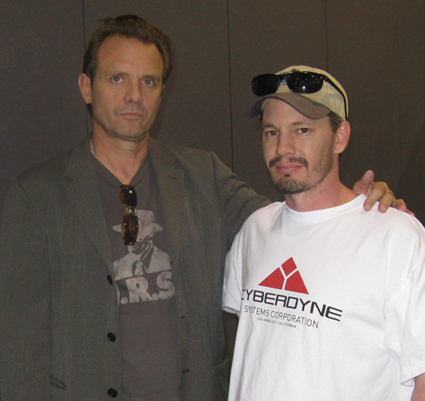 Joey Milun sent us this picture of him wearing a Last Exit to Nowhere ‘Cyberdyne’ T-shirt and Michael Biehn (aka Kyle Reese from the film Terminator). 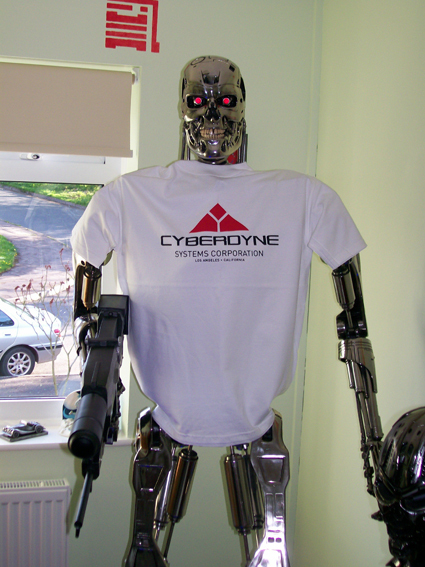 Click on the picture to buy a Cyberdyne T-shirt for yourself. Winner of best submitted picture for June is David Calcutt. David is wearing and holding ‘Old Painless’ from the film Predator. 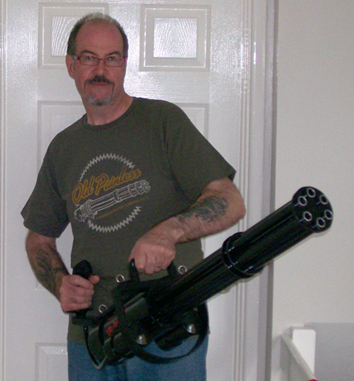 Send us your pictures to info@lastexittonowhere for your chance to win next month. 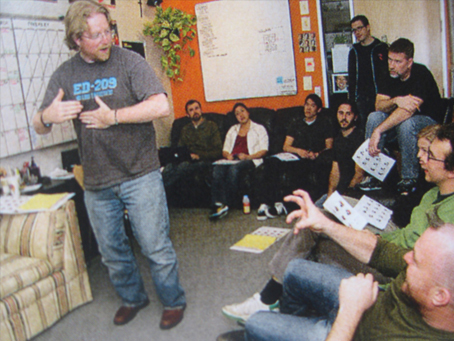 ‘Last Exit to Film Geekdom.’ Film Geeks like to show off; it’s in their job description. Whether it’s debating the merits of Lars von Trier or discussing which Evil Dead film is the true masterpiece, it’s just what they do. Thanks to entrepreneur Mike Ford, what they do has just gotten a bit easier to show off. Ford’s U.K.-based company, Last Exit to Nowhere, sells T-shirts based on fictional companies and locations from films. Although the movies represented tend to skew toward cult favourties (designs include the Winchester Tavern from Shaun of the Dead, the Urban Achievers from The Big Lebowski and Jaws’ Amity Island), Ford says this was not deliberate. This decision has caused film fanatics to rejoice, as the site has become quite popular (if for no other reason than film geeks obsessed with being in the know). Ford notes customer feedback supporting this assertion, saying, “We’ve had people comment that wearing our shirts when you cross paths with a fellow aficionado is like giving each other a silent, secret handshake.”. Click on the picture above to enter the Movie Maker competition and win Last Exit to Nowhere T-shirts. Last Exit to Nowhere customer Steve Milbank, sent us this picture of him and Nancy Allen (Officer Lewis from the Robocop films). Steve’s wearing an Omni Consumer Products T-shirt from our range. Click on the picture to buy one for yourself.